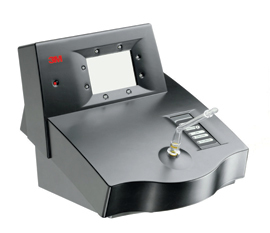 The 3M™ Remote Visual Alcohol Monitoring unit allows supervising agencies to monitor offenders’ breath alcohol levels remotely, as an independent measure or in combination with a restrictive home detention schedule. The unit can be programmed to test the individual for alcohol use during certain times of the day, or you can establish random times that the offender should perform a self test. 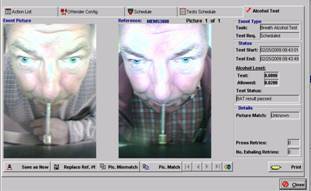 The offender begins the test by pressing a button and then blowing into the mouthpiece. The camera snaps a picture of the individual taking the test. That image and the alcohol reading are transmitted electronically into the software, and the test is complete. The identity of the individual taking the test is verified by our Monitoring Center staff which compares each image with a reference photo taken upon entry into the program. If the reading is positive or incomplete, the device will alert the offender to redo the test within ten minutes. Cellular units are available for those who do not have a land line in their home.